Paul: I am glad that I will never lay an egg. I will, thank the heavens, never have to strain to squeeze one along the length of my oviduct, before groaning as I expel it from my cloaca. I will never birth a child in a form in which they might accidentally roll away. Nature has determined that such things need not concern this human male. I am, nevertheless, a nest-builder. This I cannot deny. I’ve just moved home and the process of unpacking, arranging furniture and buying a rug is, I reckon, basically identical to building a nest. I make a snug, safe space for myself, into which I can cram everyone and everything that I want to take care of. Then I sit atop it all, making sure nothing can escape. This is why I’m so good at Go Cuckoo. Inside this small metal can is a bundle of sticks that make for a bundle of joy. 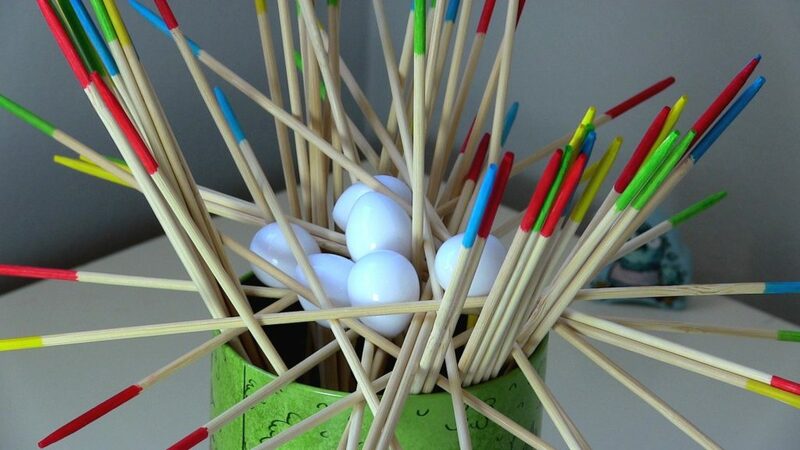 Seventy sticks, in fact, along with twenty eggs and one tiny wooden bird. Her name is Kiki. She’s going to have a difficult time. 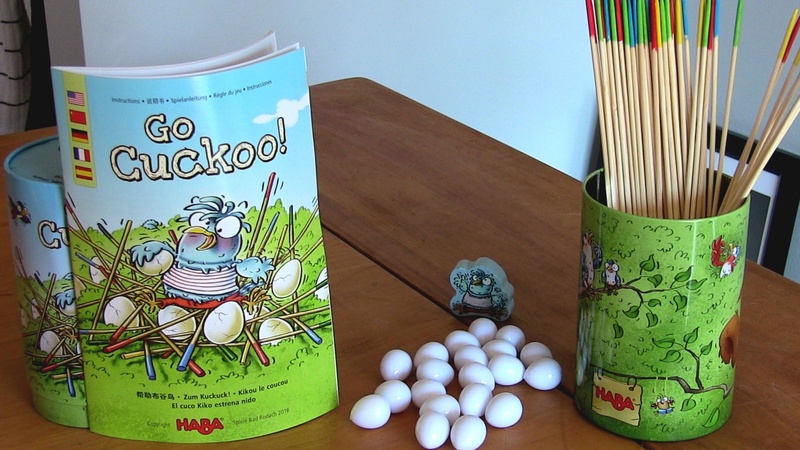 The eggs are divided up between players and the sticks remain as they were when the can was opened, poking upright and outward, displaying their colours to the world. Then, once everyone is sitting comfortably, the plucking begins. Are you sitting comfortably? 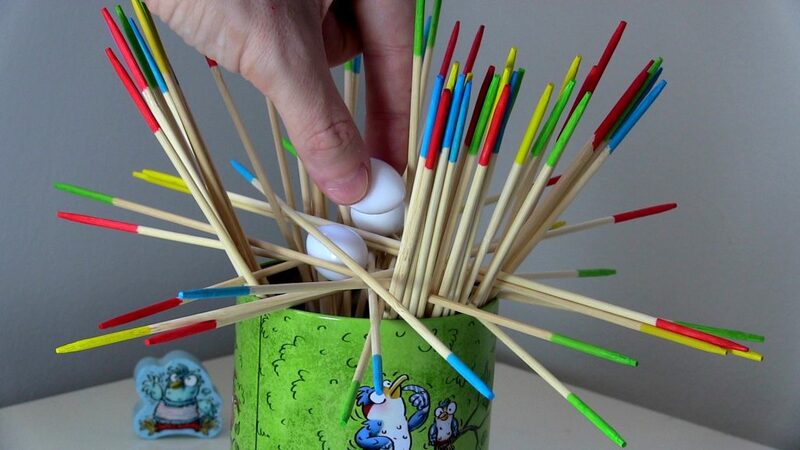 In turn, every player carefully draws between one and three sticks, guided by the colours on their tips. The other end of the stick they draw tells them the colour they must draw next, up to a maximum of three. If any of the three sticks they pull is the same colour on both ends, they stop drawing and instead have permission to lay. Their pulsing oviducts get to work. But first, and whether you’re laying or not, those sticks have to be placed across the rim of the can, forming a latticework that, hopefully, will gradually become a nest. They’re delicately, discreetly placed between the upright sticks in the hope they can support the weight of a petite, plastic egg. Can they? Is it safe? What do you think? The first egg comes down, hopefully nestling itself snug and safe somewhere in that slapdash wooden bundle. You can see exactly where this is going. Play moves around the group as more sticks are pulled and then laid, but each subsequent tug of a twig becomes more taxing. 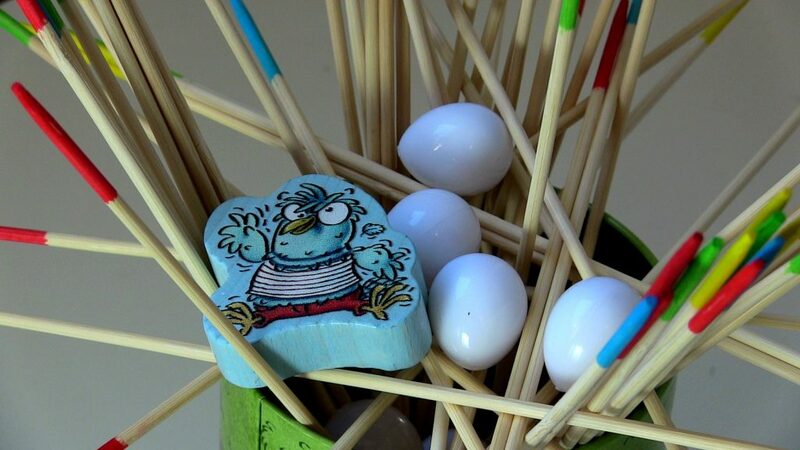 Other sticks have begun to rely on them for support, as everything leans on everything else, while eggs don’t exactly stack as well as Lego bricks. Every time an egg falls, the player responsible for losing one of Kiki’s unborn children has to take another egg from whoever is holding the most. It’s a small penalty for such irresponsible childcare and Kiki, sat to one side, has to watch this happen over and over until her nightmares are nothing but the sound of clattering eggs striking the table or the bottom of the can, her ovoid offspring forever falling to the same, inevitable fate. It’s wonderfully wicked. There’s the hesitancy of a first pull, where you notice the stick you’re tugging on has half a dozen others leaning on it and you’re about to start a wooden avalanche, or the horrible realisation that you have nowhere to place a new egg in a nest already crowded with eight others. But you must. The pushing compels you. 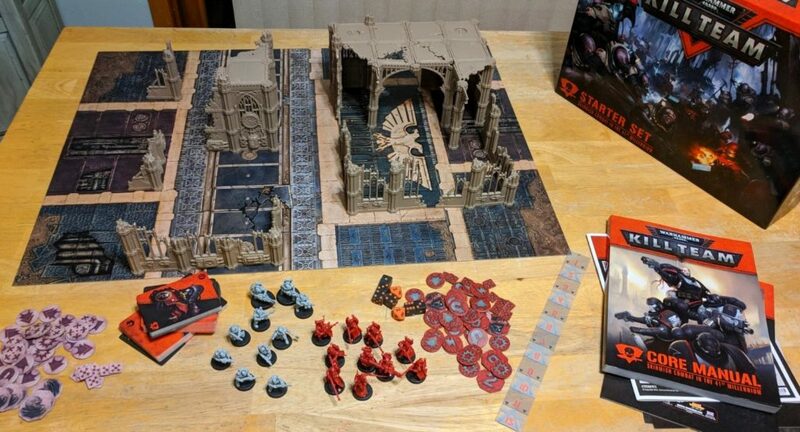 You cannot help but start a massacre. Then there’s the deviousness. 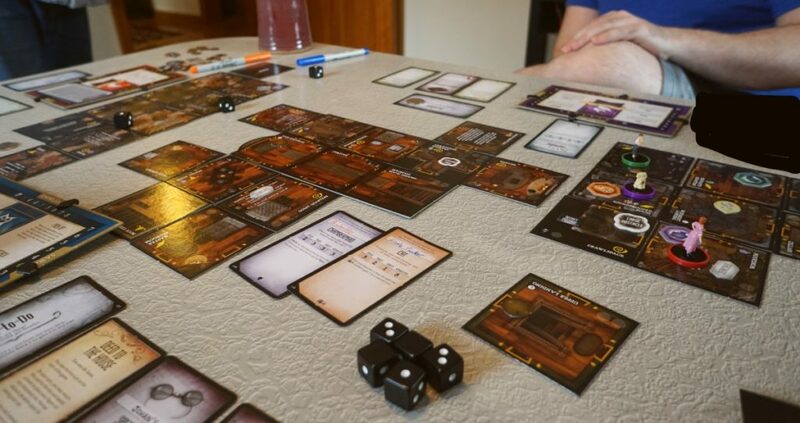 You’ve pulled three sticks and you know you’re not dropping an egg this turn, so instead you lay them as haphazardly and ungainly as you can across the already ramshackle heap in front of you. This pile becomes someone else’s problem. Or your latest, carefully balanced egg is placed just so the next player can’t help but knock it. Every turn in Go Cuckoo is about inheriting an ever-worsening heap of horror. 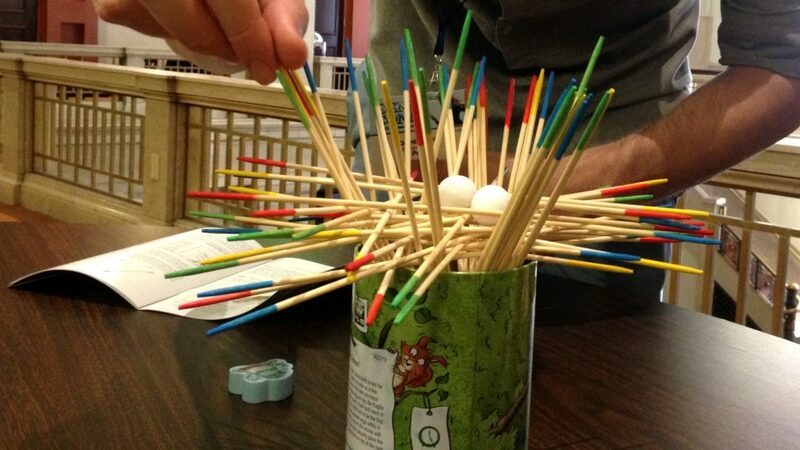 If this were a cooperative game, you might build a nice nest together. It’s not. So you don’t. 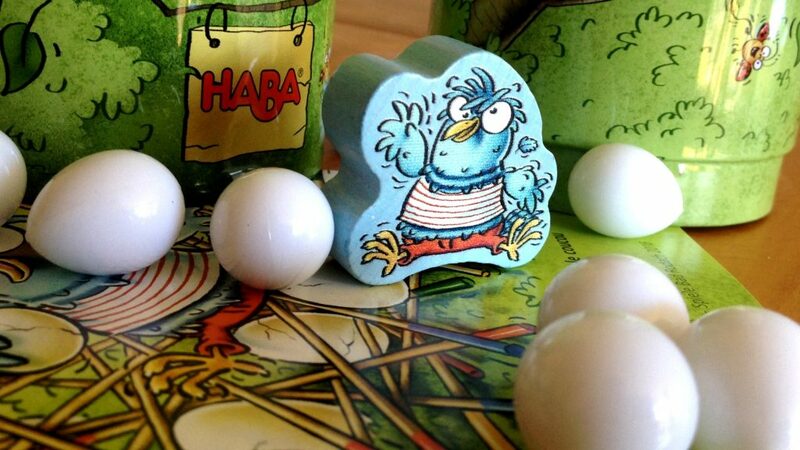 You might be surprised at how much I have to say about this and, sure, Go Cuckoo is absolutely not what I got into board games for. I fall for games with swords and dragons, for elaborate economics or for anything that encourages canny social play, but Go Cuckoo is just so gloriously simple and silly that I can’t help but enjoy myself. The climax of the game has Kiki placed in the nest. It’s the dumbest thing to ask someone to do because, as you can imagine, it’s almost impossible to find a home for this big chunk of wood amongst a the half-collapsed, haphazard disaster you and your friends have made. Eggs are going to roll. Sticks are going to fall. Sure, she fits in the end, but at what cost? 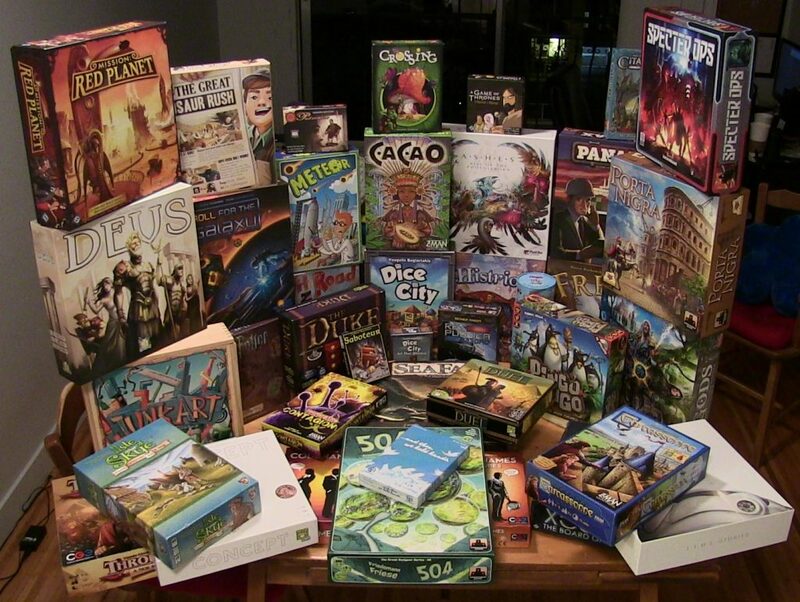 I keep seeing the term “palate cleanser” used to describe lighter and smaller games played between more serious and sober ones, but so often this term ends up reading as “blander.” Hey, here’s a perfectly okay yet unremarkable game we can crack out for fifteen minutes! Well, screw those. Go Cuckoo is the absolute perfect palate cleanser, as well as a wonderful challenge in its own right. It gets you moving about. It gets you talking. It gets you laughing. It makes you a very, very sassy bird and I really recommend it. And thank God I’ll never have children born in a form where I have to watch them roll away to their doom.